Consumers looking to purchase a vacuum sealer or replace Vacuum Sealer Bags for an existing machine often have questions before they buy. Our team of Kitchen Experts has collected the questions that are most frequently asked and compiled them into a single list with answers. We hope this answers any questions you may have, if it doesn't please use our contact us form. Can I boil vacuum sealer bags. What type of vacuum sealer bags will work in my machine? If you are buying bags from a Vacuum Sealer manufacturer, it's very likely that your bags will work only in your brand of vacuum sealer. However if you're looking for Generic Vacuum Sealer Bags, also known as Universal Vacuum Sealer Bags, they will work in almost any vacuum sealer machine. 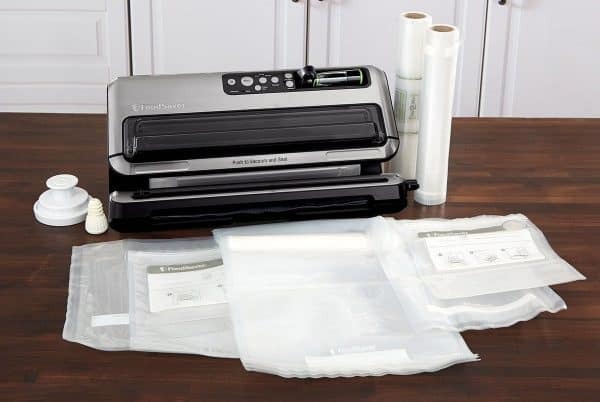 Brands of Universal Vacuum Sealer Bags include: OutOfAir Bags, FoodSaver Bags, Avid Armor Bags, Simple Houseware Bags, FoodVac Bags, Nutri-Lock Bags, and CaseKix Bags. What do the different bag thicknesses mean, and why are there two numbers for bag thickness? Bag thicknesses are measured in Mil, 1 Mil is 1/1000th of an inch, not to be confused with millimeters. The higher the Mil number the thicker the bag, so 4 Mil is thicker than 3 Mil. Vacuum sealer bags usually have two separate thicknesses, a smooth side (front) and a textured side (back). The back is almost always thicker than the front. What do do bag thicknesses mean? A bag's thickness tells how durable a bag is, and how well it will stand up to accidental rips, tears, or punctures. Thicker bags are always more durable than thinner bags. Thicker bags will also last longer in storage. If you are storing food long term in the refrigerator or freezer (longer than a month) you'll want to use thicker bags. The thickest bags we reviewed were from FoodSaver Bags and CaseKix Bags. Why is one side of a vacuum sealer bag thicker? The thicker side of a vacuum sealer bag is also the textured side, the texture is created by hundreds of microscopic one way air valves that allow air escape but not get back in. Does it matter which side is up when I vacuum seal? The smooth side of a vacuum sealer bag is considered the front, and the textured side is considered the back. You want to try and keep the front side up when you are vacuum sealing as it will give you a better seal. Your bag will seal both ways, but it will be a slightly better seal if you keep the thicker textured side down when vacuum sealing. What's the thickest vacuum sealer bag? Any bag that has both sides 4 Mil or thicker is considered a Commercial Grade Vacuum Sealer Bag. The thickest bags we reviewed were from FoodSaver Bags (4 Mil - 11.5 Mil) and CaseKix Bags (4 Mil - 12 Mil). Are Vacuum Sealer Bags Freezer Safe? Yes all brands of vacuum sealer bags are considered freezer safe. Can I boil vacuum sealer bags. ? Most brands of vacuum sealer brands are rated for 220° Fahrenheit, and are perfectly safe to boil in. Can I use vacuum sealer bags with Sous Vide cooking ? Yes vacuum sealer bags are perfectly safe for sous vide cooking. You don't need to vacuum sealer your bags to cook sous vide, but it does make the process easier and give you better results. Many people buy a sous vide first and then add a vacuum sealer shortly thereafter. Are Vacuum Sealer Bags better than Rolls? The answer here is, it depends. If your Vacuum Sealer has a spot for built in on-board bag roll storage using rolls is definitely the way to go. The convenience of not having to hunt around for where you stored the bags or finding a scissor to cut a roll is a nice feature most people will appreciate. From a cost factor rolls are slightly cheaper than bags because you're custom cutting everything to size, however it's usually a very minimal savings $0.02 - $0.03 roll vs bag. If your machine doesn't have on-board storage, go with the pre-cut bags, because they're a lot easier to work with. What sizes do pre-cut vacuum sealer bags come in? Pre-cut vacuum sealer bags come a wide range of sizes, however there are several sizes that are standard and made by most manufacturers. The most common sizes are 1 pint, 1 quart, and 1 gallon. Other standard sizes are 3 quart and 5 quart, although these are a lot less common. What sizes do Vacuum Sealer Bag Rolls come in? Vacuum Sealer Bag Rolls come in two standard width's 8" and 11". The 8" rolls are slightly cheaper but are also smaller. Vacuum Sealer Bag rolls come in different lengths anywhere from 11ft long to 50ft long, with 25ft and 50ft being the most common lengths. Longer rolls are usually cheaper per square foot. 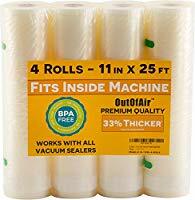 Longer rolls also have a larger diameter than smaller rolls, if your Vacuum Sealer machine has a narrow storage chamber for the bag roll you are going to have to choose shorter length rolls. The Anova Bluetooth Sous Vide is a high quality sous vide precision cooker that has all of the features you want at a great price.